Optimalisation of cost prices, technical results and financial results. 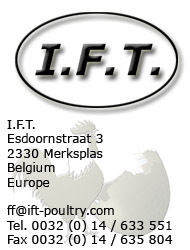 Ift-poultry will assist you in the process of optimisation step by step and problem by problem will be handled. It is, or has not been all that easy to calculate the additional income, in which various technical improvements result. It is nevertheless a question we see ourselves confronted with every single day. In order to estimate this extra income, we have, for some years already, been using our computer programme (SIMUPS), which permits us to simulate financial improvements in a very easy way. Starting with an optimisation program is not an easy task, even when you know the potential financial benefits it is bound to change your live. Big differences are easy but the last parts of percentages are difficult to manage and or to predicts . However seen the financial benefits it make sense to start with improvements and optimisations even when getting only parts of the calculated increase. SIMUPS are available for : Parent stock – Layers. We will use Cobra to simulate improvements with broilers can be used for Broilers.